The questionable but persistent neo-Malthusian argument of “global food scarcity” serves to conceal the political and economic factors that cause hunger and to deflect attention away from policy alternatives like land reform and food, argues Carmelo Ruiz. 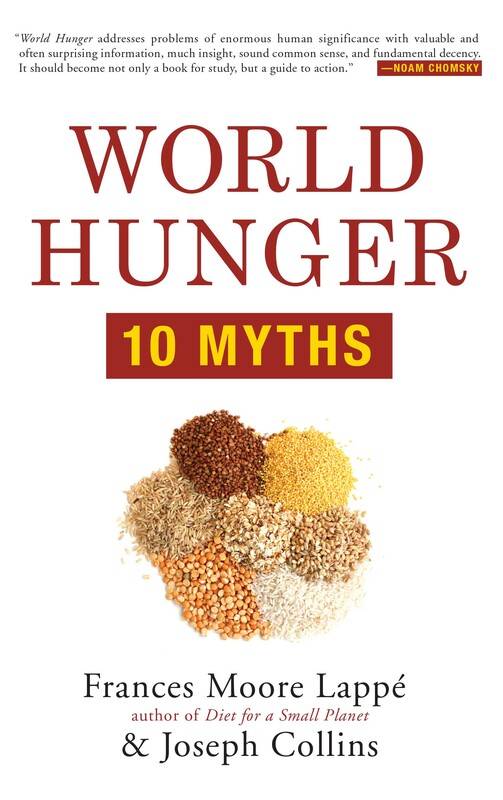 A new edition of the classic book World Hunger: 10 Myths. One of these is journalist Joel Bourne, senior editor of National Geographic magazine and author of The End of Plenty. “With skyrocketing population and tightening grain supplies spurring riots, revolutions, and immigration around the globe, experts now say we must grow as much food in the next four decades as we have since the beginning of civilization to avoid a Malthusian catastrophe”, says Bourne on his web site. Neo-Malthusian musings. Source: New Internationalist. The world today produces enough grain alone to provide every human being on the planet with 3,500 calories a day. Increases in food production during the past 35 years have outstripped the world’s unprecedented population growth by about 16 percent. According to the Food and Agriculture Organization (FAO) of the United Nations, gains in food production since 1950 have kept ahead of population growth in every region except Africa. The American Association for the Advancement of Science (AAAS) found in a 1997 study that 78 percent of all malnourished children under five in the developing world live in countries with food surpluses. These data may be dated, but after the recent years of economic crisis in the USA, the food insecurity situation in the country can only be worse now. Bourne states that “High prices are the ultimate signal that demand is outstripping supply, that there is simply not enough food to go around.” But the real world relationship between supply and price is never that simple. Bourne ignores the influence of speculation on the price of food. There is a reason to believe that a significant role was played by the entry into markets for derivatives based on food commodities of large, powerful institutional investors such as hedge funds, pension funds and investment banks, all of which are generally unconcerned with agricultural market fundamentals. Such entry was made possible because of deregulation in important commodity derivatives markets beginning in 2000. These factors have yet to be comprehensively addressed and, to that extent, are still capable of fuelling price rises beyond those levels, which would be justified by movements in supply-and-demand fundamentals. … The logic has become purely speculative, in which investors adopt a herding behavior (they follow what other investors do), and do not make decisions anymore based on the ‘fundamentals’ of supply and demand. The result is more volatility, bubbles that form and bubbles that explode. This hurts in particular small producers and the poor food-importing countries”. The questionable assumptions and economic interests behind this neo-Malthusian reasoning, as Tomlinson calls it, merit thorough study. For the most part, it has served to conceal the political and economic factors that cause hunger and to deflect attention away from policy alternatives like land reform and food sovereignty. *Carmelo Ruiz is a Puerto Rican author, journalist and graduate of Goddard College’s Social Ecology MA program. He is a senior fellow of the Environmental Leadership Program and a research associate of the Institute for Social Ecology. Ruiz is also director of the Latin America Energy and Environment Monitor and runs a blog on journalism and current affairs. His Twitter ID is @carmeloruiz.